President Viktor Yushchenko has said Ukraine has paid its debt to Gazprom in full, to prevent the Russian firm cutting off its gas supplies. But Gazprom said it had not received the money so far and "it is too early to talk about debt repayment". Talks continued in Moscow as the two sides also need to agree on a price for 2009 gas supplies to Ukraine. The Russian monopoly has threatened to cut off gas to Ukraine unless Ukraine signs a new contract by 1 January. "The money will be transferred today, in two or three hours," said a spokesman for Naftogaz. Earlier, the Ukrainian government allowed Naftogaz to borrow up to $2bn (£1.3bn) to pay the debt. Gazprom has said Ukraine owes $1.67bn (£1.1bn) for gas and $450m in fines for November-December supplies. Earlier, Gazprom chief executive Alexei Miller told Russian news television channel Vesti that "Gazprom will have no grounds for supplying gas to Ukraine" if it does not pay out its debt. Ukraine is a key transit route of Russian gas to Europe, and it is feared that a supply cut could affect countries further west. Gazprom, the world's largest gas producer, supplies a quarter of the European Union's gas needs, or 42% of EU's gas imports. 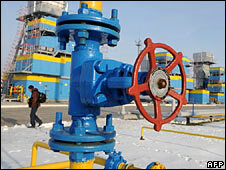 A similar row between Gazprom and Ukraine in 2006 led to gas shortages in several EU countries. 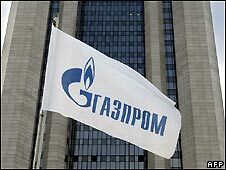 Separately on Tuesday, Gazprom reported a solid rise in profits and sales following record gas and oil prices in the first half of the year. For the six months to 30 June, net profit jumped 85% to 609.4bn roubles ($20.8bn, £14.2bn) compared with the same period in 2007. Sales rose 52% to 1.74 trillion roubles on both higher prices and volumes. However oil prices have slumped from July highs and most observers expect oil firms to see future profits slide. The firm also said the credit crunch has affected its ability to attract loans. "At the moment the management can not certainly assess the impact of further decrease in financial markets' liquidity and the growing instability of foreign exchange and stock markets on the group's financial state," the company said in a statement.